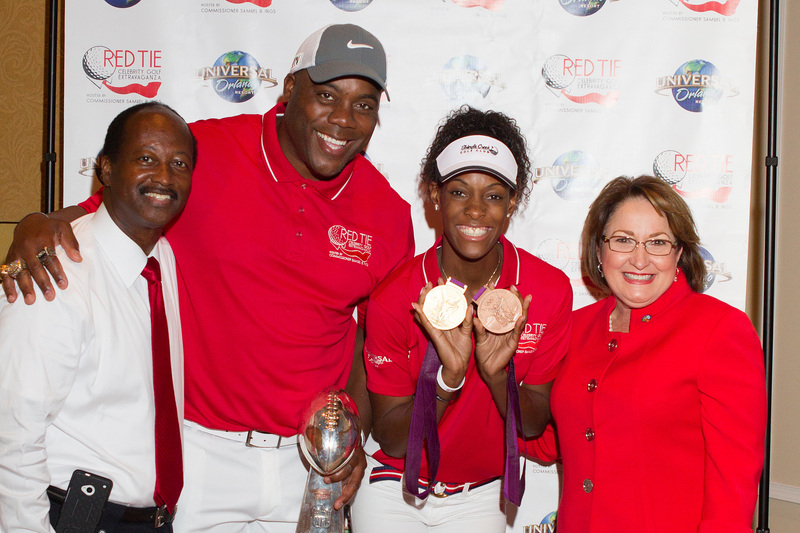 Mayor Teresa Jacobs recently attended the 4th Annual Red Tie Celebrity Golf Extravaganza, which was hosted by District 6 City of Orlando City Commissioner Samuel B. Ings at Single Creek Golf Club on Universal Boulevard. The event provided an opportunity for residents to compete in a game of golf and network with celebrities, business and regional civic leaders. The annual event benefits more than 20 community programs within the area of District 6, which extends from Vineland and Conroy Road through International Drive in Orlando. Several notable sports figures were present at the event including DeeDee Trotter, a three-time Olympian in Track and Field, and Roland Williams, an author, sports analyst and Super Bowl champion. Trotter trained in Orlando and is currently a model with the Wilhelmina agency. Williams has appeared on many cable and TV networks, including radio, online and print publications. Williams is an eight-year NFL Veteran and Super Bowl XXXIV champion. Actor Vinicius Machado, an Orlando native who graduated from Dr. Phillips High School, was the featured speaker at the luncheon. Machado spoke about how he continued to believe in himself – even while he had to sleep in his car before his rise in Hollywood. His long list of film credits includes appearances in the Golden Globe award-winner Monster, The Celestine Prophecy, Get Smart, Fast Glass, Sunken City and Real Premonition. Vinicius’ newest project is a Starz TV show titled Power, produced by Curtis “50 Cent” Jackson. Currently, he is filming a new movie in Hollywood called Twisted with Rob Lowe. The Red Tie Celebrity Golf Extravaganza was created in 2011 by Commissioner Ings to support the youth and seniors in the area. Other elected officials also joined the Red Tie celebrity Golf Extravaganza, including several City of Orlando Commissioners, Orange County Commissioner Pete Clarke, Orange County Property Appraiser Rick Singh, and Mayor Bruce Mount of Eatonville. A collection of photos from the Red Tie Celebrity Golf Extravaganza event are available on Flickr for use by the media.